Automaker Honda Motor Co. and internet company SoftBank said Thursday they will work together on artificial intelligence to develop products with sensors and cameras that can converse with drivers. Asimo, first shown in 1996, walks, runs, dances and grips things. Pepper, which went on sale last year, doesn't have legs but is programmed to recognize mood swings in people it interacts with. Major automakers and technology companies are interested in robotics to improve driving safety and comfort. But experts say humans are still better at driving overall than the smartest machine. Honda said it's focusing on AI research with a new laboratory in Tokyo set to open in September. SoftBank said its robotics unit Cocoro SB, which is researching cloud-based artificial intelligence, will work with Honda on research that seeks to harmonize mobility with people, so that drivers can feel a kind of friendship with their vehicles. 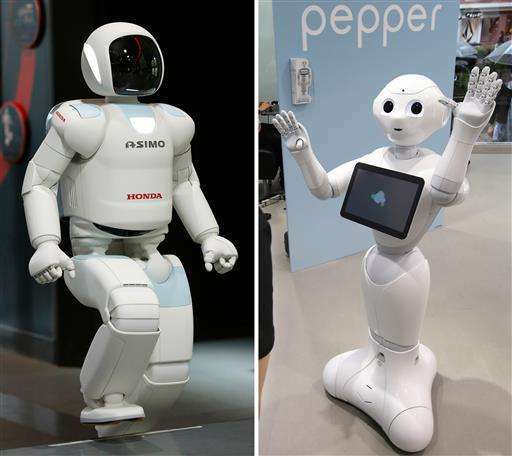 SoftBank said it was a pioneer in making machines that can be friends with people through its Pepper robot. Tokyo-based Honda's robotics division went through some soul-searching when Asimo was widely criticized as useless when it could not help with the nuclear accident at the Fukushima plant, which sank into meltdowns after the March 2011 tsunami. Among Japan's automakers, Toyota Motor Corp. has invested $1 billion in a Silicon Valley-based robotics research unit to develop not only safety features but also self-driving vehicles. Nissan Motor Co. has announced it will start selling soon in Japan a vehicle equipped with self-driving technology, and plans similar products overseas. Safety worries have grown after a recent fatal crash involving U.S. electric car maker Tesla Motors' vehicle with its semi-autonomous Autopilot system. Like Nissan's system, it can maintain a set speed and keep the car within its lanes.